When you are looking for the Best Flash Trigger Kit on the market, you should look for low sync speeds and multi-channel options. In this article, we will be looking for some of the budget options that we have today. With technology gradually spreading through almost every walk of our lives, even traditional photography is not left behind. These days, you no longer need to connect the flash to your DSLR cameras. This has been made possible with the wireless flash triggers introduced by different manufacturers. What makes it even more convenient is these flash triggers work seamlessly with almost all major camera brands. If you are looking to buy the ideal flash trigger kits for your Nikon or Canon cameras, here are the best options you can check out. Before you choose a Flash Trigger for your Nikon or Canon camera, it is essential enough to give a thought to a few important characteristics that your new flash trigger comes with. So, what should you look forward to in your flash trigger kit? This is an important factor that plays a significant role in a flash trigger kit. If you are frequently shooting in the outdoors and want to keep a distance from the subject, the working distance should be the primary criterion. Ideally, a distance of 30 meters should be the best, while you have the options that offer a range of 100 meters. The rate and sync should be dependent on the wireless remote control that it comes with. A few ideal speed options you can go with include ½s, 1/8000s, and 1/200 seconds. Which are camera are you going to use the flash trigger kit with? In case you are not going for the right kind of package that is compatible with your camera, you may end up with a wasted purchase. Of course, there are flash trigger kits that work with practically all major models and manufacturers, but there may be cases where you want a package explicitly made for a particular model or manufacturer. 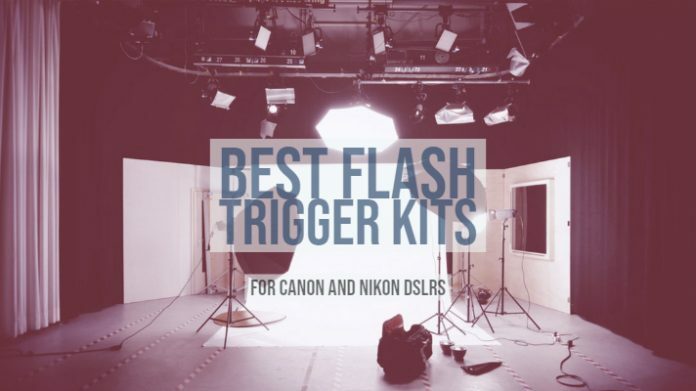 With a wide range of options available at your disposal to choose the best options for the flash trigger kits for Nikon and Canon, we will let you select the best through the choicest options through our top picks. Adopting a global free FSK 2.4GHz wireless channel, the Yongnuo RF-603 II RF603 II 603II Wireless Flash Trigger should be compatible in most countries without hiccups. The remote control ranges with the flash trigger can reach up to 100 meters. The Yongnuo flash trigger offers you a budget option for an effortless functionality for your flash requirements. It comes with multiple features packed into one and works both as a flash trigger and as a receiver. 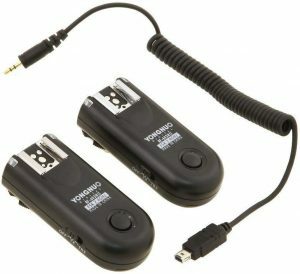 It can also be used as the remote shutter release for your camera. The unit is operated with two AAA batteries. The battery backup is reasonably good enough, and you do not need to switch them quite often. These triggers are compatible with most of the camera brands, making them universally suitable. The trigger comes with an enhanced on-off switch that is easy to access. If you are starting with the off-camera flash, this can be an excellent option for your needs. Of course, being a basic model and a simple one at that, it does not offer you additional functionalities. You can have a look at them at this link on Amazon. If you are looking for a flash trigger kit that meets your day to day requirements, the Altura Photo Wireless Flash Trigger can be an excellent alternative for your Canon range of DSLRs. The camera flash trigger is compatible with almost all models of your Canon cameras. 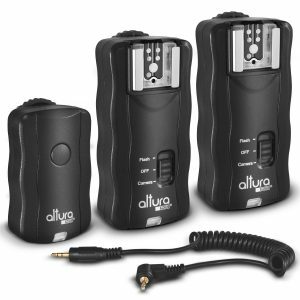 The Wireless Flash Trigger and Dual Receiver Kit from Altura Photo should let you get a wireless triggering of up to 100 feet distance. A flash trigger kit is an excellent option for photographers with any level of expertise. One of the best choices among the high-quality products, it is available at an affordable price band. An excellent 30-meter operating distance that should suit a wide range of situations like events, groups, and portraits. The kit comes with multiple purpose functionalities. If those features tend to impress you, why not check it out here on Amazon? Own a Nikon DSLR camera and looking for a good flash trigger kit for it? 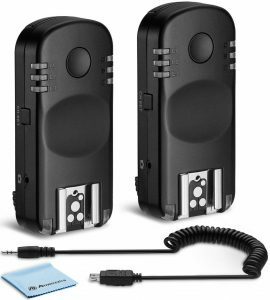 Look no further than the Powerextra Professional Wireless Flash Trigger. What makes it one of the prime options is it suits all the Nikon camera models. It comes with a trans-receiver function where it acts as both as a wireless flash trigger and receiver. The flash trigger kit also offers you an excellent autofocus functionality. With a working distance of around 100 meters, it should suit most of your requirements. You also have access to a 2.4 GHz wireless remote control for easy access too most of its functions. The seven-channel functionality to avoid any sort of interference. Flash trigger can fire two flashes at the same time. The flash trigger is compatible with almost all Nikon DSLR models, some representative models being DSLR D90, D600, D610, D750, D3100, D3200, and D5000. It can be one of the ideal options for a wide range of purposes that includes portraits, group shots, event photography and many more. Want to give it a try? You can check it out and know more about it at this link on Amazon. 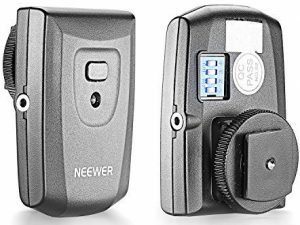 If affordability is what matters to you, the NEEWER RT-16 Wireless Studio Flash Trigger should be an ideal choice for any of your requirements in a flash trigger for Nikon and Canon DSLR cameras. Given the fact that the working distance is one of the major areas that you need to give a thought to while buying a flash trigger, the 30 meters range offered by Neewer should be the best you can go with. The flash trigger also offers excellent sync speed and also comes with an ergonomic design for easy handling. The trigger is one of the best alternatives for a long-range shooting where you have minimal or no interference. It does not need you to be a professional to use it. The flash trigger comes with an easy installation option. High speed and synchronous operation should make it a great choice. It works with two AAA batteries and offers you a lifetime of over 20,000 triggers continuously. You have access to a 16 channel selectable functionality. Sounds impressive enough? You can get more information about the flash trigger on Amazon. 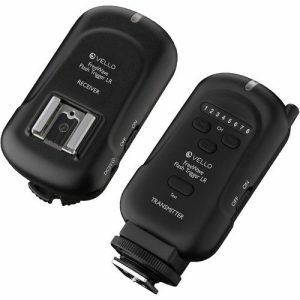 One of the best in terms of a reliable and versatile control kit for the best experience for off-camera flash units, the Vello FreeWave LR Wireless Flash Trigger and Receiver Kit should be an excellent option for your needs. The flash trigger uses the 2.4 GHz frequency that will provide you with an interference-free performance. Since the radio frequency does not need a line of sight function, you will have no issues like the interference from the walls and other elements. The metal foot on the trans-receiver should provide you with an excellent choice concerning durability. If that is what you are looking for, you can check it out at this link on Amazon. Given the full range of options available for the wireless flash triggers, it should be evident that you will find that you should have no issues firing the flash easily in a broadcast mode. We have made it a point to list out the user-friendly and practical options for the best flash trigger kits you can use on your Canon and Nikon cameras. Have you used any of these flash triggers for your flash requirements? If you have, do share your thoughts and opinions with us through the comments section here below.